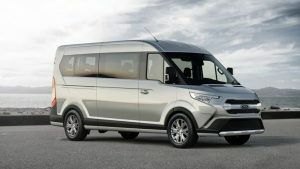 INDIANAPOLIS, 2019: Proving once again that the best never rest, Ford – North America’s van leader – improves its best-selling Transit family with smart new technology, advanced driver-assist features and enhanced capability for a wide range of customers whether they use their vans to carry kids, seek out adventures or deliver cargo. Upgrades include an available all-wheel-drive system, all-new 2.0-litre EcoBlue® bi-turbo I4 diesel, all-new 3.5-litre PFDi V6 gasoline engine with port fuel and direct injection and new 10-speed automatic transmission, plus new interiors and seating options. The 2020 Ford Transit offers the most vehicle configurations in its class to help customers specify just the right van for any job. In addition to cargo van, passenger van, chassis cab and cutaway, a new crew van joins the lineup. It can carry five people in two rows of seating with side curtain airbags. Because work doesn’t stop when the weather gets bad, Transit offers an intelligent all-wheel-drive system that’s always on to provide enhanced traction on icy, snowy or muddy roads. In normal mode, this all-wheel-drive system continuously monitors and optimizes torque output with the capability of sending up to 100 percent of available torque to the front wheels to help prevent slipping on loose surfaces. Using the vehicle’s selectable drive modes, the driver can engage mud and ruts or slippery modes at any speed to help increase the all-wheel-drive system’s capability for traveling in challenging conditions. With 2020 Transit chassis cab and cutaway models, customers can also carry more, as the maximum GVWR increases from 10,360 pounds to 11,000 pounds. New and improved powertrains are designed to meet a wide range of customer needs including advances in fuel efficiency. The all-new 3.5-litre PFDi V6 is the new standard gasoline engine An available all-new 2.0-litre EcoBlue® bi-turbo I4 diesel engine is more fuel-efficient and offers more power and torque than the outgoing 3.2-litre diesel engine. It is equipped with Auto Start-Stop and is quieter than its predecessor. Customers can also choose the proven 3.5-litre EcoBoost® gas engine, which now includes Auto Start-Stop Technology, as well. Both gas engines can be ordered with dual 250-amp alternators to provide a robust power supply for upfit equipment. All engines are paired with Ford’s proven 10-speed automatic transmission, which offers a wide span of gear ratios, off-the-line performance and low engine speeds while highway cruising – all designed to contribute to improved fuel efficiency for model year 2020. The upgraded 2020 Ford Transit will arrive this fall.